The bridge sank in the middle when the foundations were washed away. The first bridge over Tallebudgera Creek was erected by the Nerang Divisional Board, through the Public Works Department, in September 1885. It was situated upstream nearer to the township of Tallebudgera and was of a considerable size, being approximately 271 feet in length. The successful tenderer for the building of the bridge was Mr J. Johnston at a cost of £2224/10s/10d. Early in 1888, local residents called on the government to direct their attention to the dilapidated state of the bridge. Although the structure had only been built a couple of years earlier it was claimed that poor workmanship had resulted in the bridge being too dangerous for traffic to cross. Communication between residents on either side of the creek was interrupted, mail coaches and heavily laden horses or drays were only able to cross the creek at low tide and significant danger was posed to drivers and their passengers, goods, mail and horses. As a result, settlers, timber-getters and farmers experienced great difficulty accessing local markets. 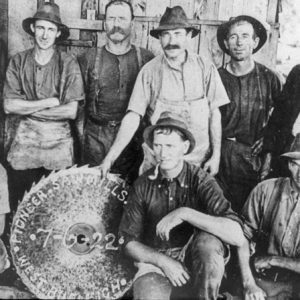 By the time the idea of a replacement bridge was being considered the old bridge had been in a poor state for many years and the railway line, which had been extended to Tweed Heads by 1903, had bypassed the township of Tallebudgera altogether. Rail traffic was going to Booningba/West Burleigh station. In September 1925 the Mayor of Coolangatta, Alderman J.T. 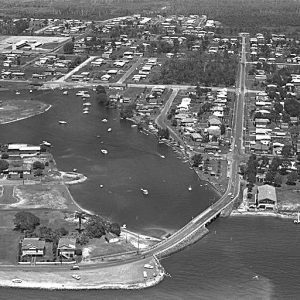 Mathers, pursued the issue of road transport crossing Tallebudgera Creek. A report was submitted to the Town Council regarding the construction of a new bridge which was intended to complete a missing link in the South Coast Road between Burleigh Heads and Palm Beach. 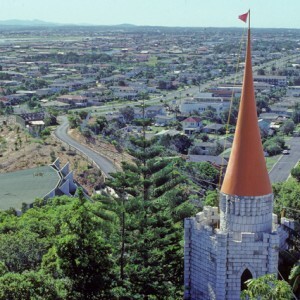 Following this, both the Coolangatta and Nerang councils made an application to the A.M.P. Society for a loan of £5000 each to cover the cost of construction. A tender was accepted from Mr Peter Blondell to build the bridge for £8828/8s with a completion timeframe of eight months. A portion of land required in order to build the bridge on the new site was donated by Mr Sam Andrews. The piles and headstocks of the new bridge were built of reinforced concrete and the balance of heavy timber over a length of 498 feet and a width of 19 feet. Although not yet completed, the contractors decided to open the bridge early, to slow traffic at the traveller’s own risk, on Sunday 8 August 1926. This was to accommodate coastal residents planning to attend the Royal National Exhibition in Brisbane. A charge of 5 shillings was placed on each vehicle to recoup the cost of any damage caused to the uncompleted road and to pay the workers who were engaged to supervise traffic. The Mayor of Coolangatta also agreed to a proposal to benefit the ambulance brigades of both Coolangatta and Southport by asking motorists for a non-compulsory donation. 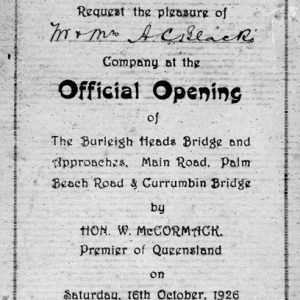 The Burleigh Heads Bridge, as it was officially named, as well as the recently completed Palm Beach Road and Currumbin Bridge at Thrower Drive, were all officially opened on Saturday 16 October 1926 by the Premier of Queensland, William McCormack. 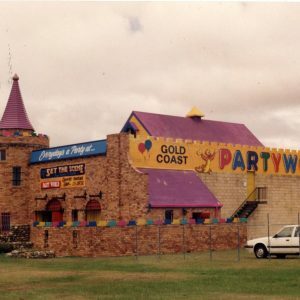 This was followed by a luncheon held at the Palm Beach Hotel, a former boarding house which was partly converted to licensed premises in anticipation of increased motor traffic flowing through the township towards Coolangatta. Despite being officially known as the Burleigh Heads Bridge it has long been colloquially known as the Tallebudgera Creek Bridge. 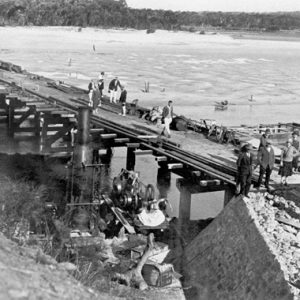 Cyclonic weather and floods in February 1931 caused widespread damage to buildings and infrastructure in the region and the Tallebudgera Creek Bridge suffered damage. It sank three to four feet in the middle when the concrete piers in the centre sunk when the foundations were washed away. Such was the force of the flood waters that the creek cut a new channel on the Palm Beach side which necessitated the construction of an additional 100 feet of bridge. After undergoing repairs the bridge was reopened about a month later, although vehicles utilising solid tyres were prohibited. 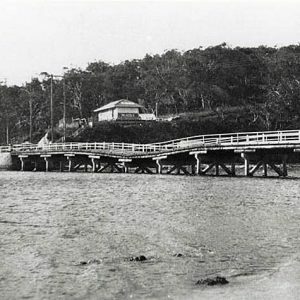 It was not until December 1968 that the four-lane Tallebudgera Creek Bridge, still in use today, was opened to replace the wooden structure first built 1926. 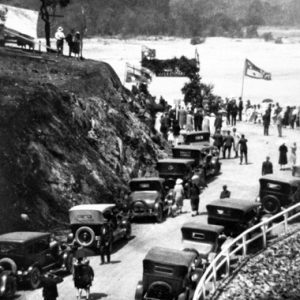 Opening ceremony for the Tallebudgera Creek Bridge, 1926. Photographer unknown. Brisbane Courier (QLD: 1864-1933) 31 Dec 1885, P. 4. “Open for Traffic.” Brisbane Courier (QLD: 1864-1933) 21 Mar 1928, p. 25. “Tallebudgera Bridge.” Southern Queensland Bulletin (Southport, QLD: 1888-1891) 31 Mar 1888, p. 2. “Tallebudgera Bridge.” Telegraph (Brisbane, QLD:1872-1947) 11 Sep 1925, p. 12. “Royal National Exhibition.” Brisbane Courier (QLD: 1864-1933) 10 Aug 1926. p. 13. “Motoring Toll” Daily Mail (Brisbane, QLD: 1903-1926) 11 Aug 1926, P. 6. 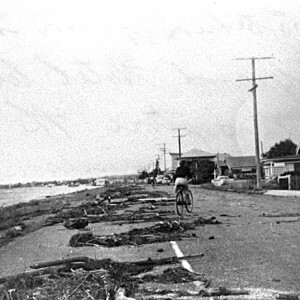 “Aftermath of Flood.” South Coast Bulletin (Southport, QLD: 1929-1954) 13 Feb 1931, p. 7. “Tallebudgera Bridge Crossable.” South Coast Bulletin (Southport, QLD: 1929-1954) 27 Mar 1931, p. 7.